Booch is a hand-crafted organic kombucha business from London, Ontario, Canada which uses local, organic and fairly-traded ingredients. They have a brewery retail store, a market location, and you can find their brand of kombucha in numerous good stores. Booch has developed a wonderful community who enjoy kombucha and its health benefits. We’ve had the pleasure of getting to know Shannon and Shawn from Booch over the past year. It’s been amazing to witness their growth as well as their devotion to a community centred on socially-responsible values. Stepping into the Booch brewery store to taste their latest seasonal variety is an experience I always look forward to! Whether you are curious about kombucha, starting your own wellness product, or wanting to know what it means to be socially-responsible in business, we hope this interview with Booch Founder and Master Fermember Shannon Kamins will inspire you! WEHL: Can you remember the first time you tried kombucha? What was your experience like? SK: I tried kombucha for the first time about 7 years ago. I was at Organic Works Cafe in London and I bought a bottle of GT’s – one of the first commercially distributed kombuchas on the market. It was ”love at first sip” and I was immediately hooked. I loved the acidity and tangy-ness of the product, and I could tell that kombucha would soon be my new favourite beverage. WEHL: How has your local community in London, Ontario been an inspiration in the growth of Booch Organic Kombucha? London is becoming a hub for start up businesses, and the entire community has been supportive of Booch since day 1. I’ve noticed that the people of London are starting to really care about connecting with the farmers, the owners, the producers, and are starting to make better decisions by voting with their dollar in support of “local”. It’s been an inspiration to watch people choose our dark amber bottle from a wall full of other kombucha brands. One of my favourite things is walking down the street in London, and peeking into cafes to see who is drinking Booch. London never disappoints, they are always drinking it. I’ve seen people on the street drinking it while I drive by, I see people sitting at a cafe with it, I see people stocking up at health food stores. I’ve never seen so much community support of a product. They know we are local and their choices mean a lot. It is exactly what we need for our continued growth. WEHL: What’s been one of your biggest challenges in growing a socially-responsible business? SK: One of our biggest challenges in growing a socially responsible business has been our fast-paced growth. When I started the business just over 2.5 years ago I thought I would be brewing about 100L of kombucha a week. We are now brewing around 4000L per week and still trying to keep up with demand! We authentically brew and ferment our kombucha. The challenge however, is how we deal with this fast-paced growth while still ensuring that we put socially conscious business decisions at the forefront of our minds. We get busy, and so often times, I try to remember why were are here in the first place. The purpose was to ”connect”. Connect with the community, connect with the farmers, and ultimately find connection within. It is an ongoing effort to ensure that Booch embodies its values. We are committed to food security, health promotion, connecting community, and environmental sustainability. Just a few weeks ago we made the decision to increase our spending on compost removal to ensure that every single paper towel, orange peel, tea leaf, and botanical that is used in our Brewery gets composted. This turns out to be about 600L of compost per week! We also decided to change our ingredients in our best selling flavour – Raspberry Lemonade. We now use lemongrass instead of lemons, which allows us to source closer to home. We provide strong liveable wages and other supports to our team and hold events to give back to the community. We donate to charities that align with our values and fund the growth of green energy through Bullfrog Powered. Every day we try to be better than the day before, and I am constantly looking, and open, to bettering ourselves. WEHL: What are some of the health promoting benefits of Booch Organic Kombucha? SK: The health benefits of Booch include promoting proper digestive function, increased diversity of microbiota, aiding in the absorption of food, and strengthening the immune system. Booch also contains organic acids which aid in detoxing the body, including the liver. As a celiac, I have found that Booch has helped with stomach discomfort and bloating, and I use it as a digestive aid with meals to help break down my food. At Booch, we are believers and advocates for a diet high in a variety of fermented foods, not only kombucha. We believe that adding other fermented foods into your diet such as sauerkraut, kimchi, jun, sourdough bread, fermented nut cheese etc. all help to build the immune system. There is also a lot of research demonstrating the power of the connection between gut health and mental health, and so we like to touch on this because mental health is very important. If you have an irritated gut, you may also have an irritated mind, and so soothing the gut, can have lasting effects on the mind and body. 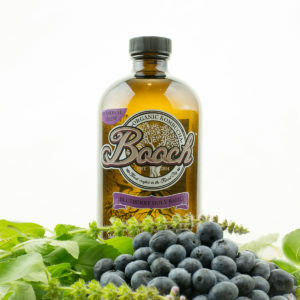 WEHL: We’ve experimented by using Booch in a pancake recipe (works great!). Do you use Booch in any cooking or baking recipes? SK: Amazing! I have never personally baked with Booch, but I do use it in my diet regularly. I add ginger Booch to olive oil to make a living probiotic salad dressing, or I add it to my smoothie to make it more digestible and absorbable. I also use Booch as a starter to help ferment my steel cut oats, and sometimes even add some chai Booch to a glass of wine to make a fall inspired sangria. The possibilities are endless. WEHL: What tips would you have for couples who are embarking on an entrepreneurship journey together? WEHL: Do you have any thoughts on the future of the wellness industry? SK: My hopes are that the industry grows from a place of authenticity over sales. I have seen brands use buzz words or claims on products over and over again as a tool for marketing that don’t actually align with the company’s actions. Values and actions should align in the wellness industry (and all industries) in order to offer a product/service with integrity. Have you tried a glass of Booch organic kombucha? Let us know!